Very decent whisky. The oak is a little too dominant for my taste though. Light peat smoke. Heavy cask influence that shows in a pretty rich spiciness. The sherry has to stand back in line at first. Then it shows with quite some sweetness. A kinda floral and peppery touch as well. Powerful start, but oily at the same time. Very spicy oak initially. Quite some peat smoke from the start. More than in the nose. Little sweetness, just a hint of sherry left over. Becomes pretty bitter and quite dry. Medium long finish. Mostly bitter oak and light peat smoke. Malty. De taste unfolds wonderfully in the mouth, the volatile elements quickly and the sherry-wood substance remains and it runs the water in the mouth together. After a long time, the whisky is gone. We find a beautiful smoky and oily peat. A beautiful and complex length for a whisky of this age. Blindly it could easily be confused with an HP. Cinnamon, gasoline to burn, therebentine. Wet leather. Long. Phenolic, asphalted, vegetable tar. Smoke. Beautiful fat and oily conclusion. This Springbank has more of a Highland Park profile than a Springbank profile, but it's pretty good. Peat smoked and iodized, a little dry straw. All this with a layer of sherry over: dried leather, dry sherried fruit (black plum), sweet spices. A good nose that does not fade. Salty dried fruits, a little hay in the background. Very fat and oily in the mouth. A milipoil of phenol. Exotic spices. Dry final (more on grass than wood) and peppery. Long in the throat. Good drinkable 54.6% go very soft and oily. Dreamcloth. Delicious. Soft. Smoky, with a sweet not too sweet Sherrynote. 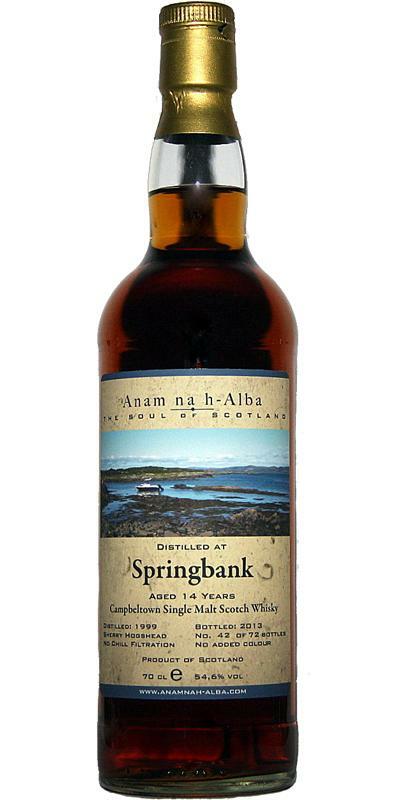 The typical Springbank taste is knotlessly intertwined with sherry and salt! Class. He comes to stay. Fettich ... öölich ....: D ... a fine match between sherry, smoke and sea.